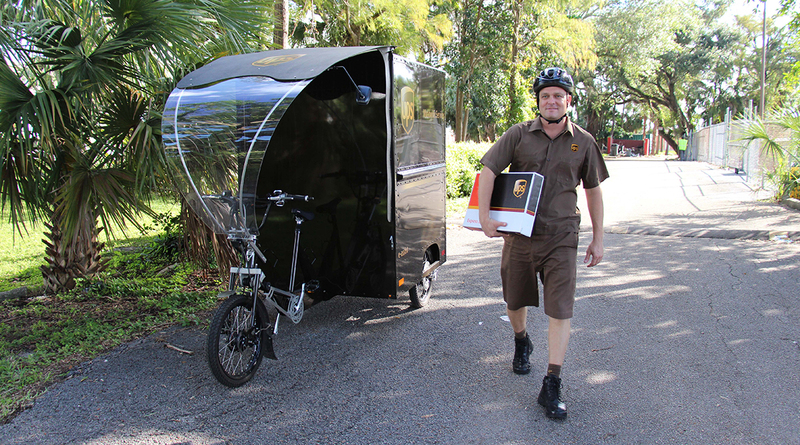 Fort Lauderdale, Fla., will soon become the first city in the state to use electric tricycles to deliver packages to businesses and homes, according to UPS Inc. and city officials. The tricycles will ply their trade in and around parts of Las Olas Boulevard. As the city redesigns the Las Olas district to make it more bicycle and pedestrian-friendly, fewer large trucks, taxis, and other vehicles will find room to maneuver. RELATED: UPS debuts delivery by electric bike in Portland, Ore.
To adapt, UPS will use the so-called eBikes to deliver packages beginning Dec. 11 on Las Olas between Southeast 12th and 15th avenues, and in the Colee Hammock neighborhood. The eBikes look like a scaled-down version of the big brown, square UPS trucks — but they’re tricycles, which are easier to handle in bicycle lanes. City officials said they’ve met with Yellow Cab, Uber and Lyft to set up designated zones for passenger pickup and drop off so the cabbies and ride-hailing drivers won’t have to navigate a narrower Las Olas. It’s part of the Las Olas Boulevard Traffic and Safety Calming Community Investment Project and Vision Zero, a citywide effort to reduce traffic injuries and deaths.